BRDS has total 3234 selections in NIFT since 2005. 575 BRDS Students are selected at NIFT in 2018. Best Performance in 13 consecutive years in NIFT higher than any other Coaching Institute. AIR 1, AIR 3, AIR 5 in 2018 are BRDS Students. 50 BRDS Students in NIFT Top 100 (B.Des / MFM / M.Des / M.F.tech). 10 Days NIFT Situation Test Workshop will be scheduled at all BRDS Centres. Student who enrolls for this option will get a Home Coaching DVD Pack for preparation as soon as they register. Introduction on creative thinking, design concept and working on themes. 3D model making – basic and advance model making techniques. Writing skills – Tips on preparing a write up. BRDS Faculties: Conducted by NIFT Alumni. Free home coaching DVD includes 100 material handling video lessons. 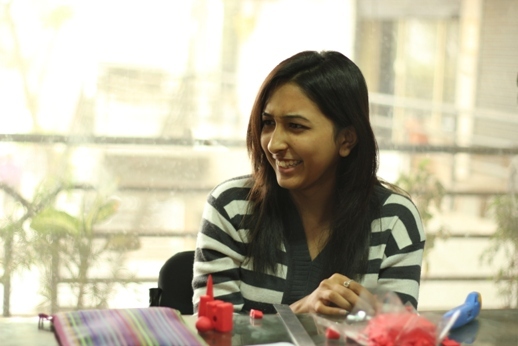 Orientations towards design thinking, design concept, 3D model making -basic and advance model making techniques, Writing skills, Original and Mock test papers, practice exercises and many more. Workbook -covering all aspects of Situation test, 17 year’s NIFT original papers and 10 mock test papers. 50 Situation test practice exercises. 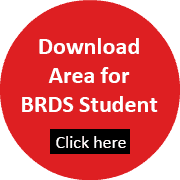 BRDS offers Instant download study material for NIFT Situation test. Material is provided in the form of Videos, pdfs, eBooks, workbook and can be prepare from Home. 5 days NIFT GDPI Workshop will be conducted at all BRDS Centres to help students to face their GDPI with confidence. After successfully crossing the first hurdle (the M.Des/ MFM/ M.F.Tech written entrance exam), aspirants have to appear for GDPI– the Group Discussions (GD) & Personal Interviews (PI). These stages of the selection process give the selection committee a deeper insight into a candidate’s personality. During a GD a candidate’s understanding of the topic, attitude, self-confidence, presence of mind and leadership skills are put to the test. Creating an impact within the limited time frame, under pressure, plays an important role here. Every candidate needs to be well prepared before facing the panelists. The perception that because NIFT is a fashion college so the topics for GD’s will revolve around fashion is not right. * Communication skills, Interpersonal Skills, Leadership Skill, Motivational Skills, Team Building Skills, Analytical /Logical Skills, Reasoning ability, Different Thinking, Initiative, Assertiveness, Flexibility, Creativity, Ability to think on one’s feet. Discussing and solving of original NIFT Situation test paper. Personal training by NIFT Alumni at any BRDS centre. Why should I Join BRDS ? 2. Result published in Newspaper: You may find some institutes putting up results on websites but will never find results in Newspapers as fake results can not be printed in newspaper. BRDS is the only institute that prints year wise results in newspaper with details including college name. 3. Media Release: All leading newspapers releases coverage about BRDS results, activities and events testifying the stature of BRDS as India’s leading design coaching institute. 4. BRDS Challenge: BRDS offers a challenge of providing free lifetime Education and a cash reward of Rs.50,00,000/- to the person who can prove that any other coaching institute in India gives more results compared to BRDS. 5. Faculty: Most coaching institute mention about having NID /NIFT / IIT alumni as faculties but no one faculties as good as to BRDS. BRDS faculties details and profile are published on website and brochure which you will not find in any other coaching institute. Situation Test has 20% weightage, and is an important deciding factor, in your admission. Students who have applied for Bachelor of Design Programme are called for Situation Test after clearing their written test. 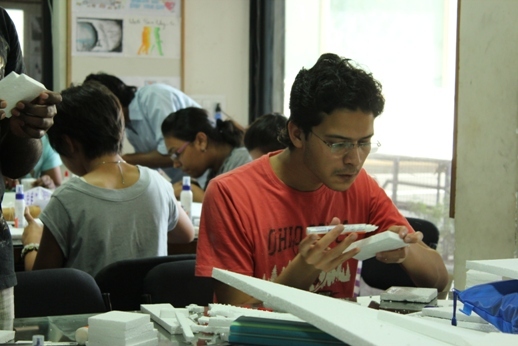 NIFT calls students, three times the number of seats, for the final and qualifying round of Situation Test. 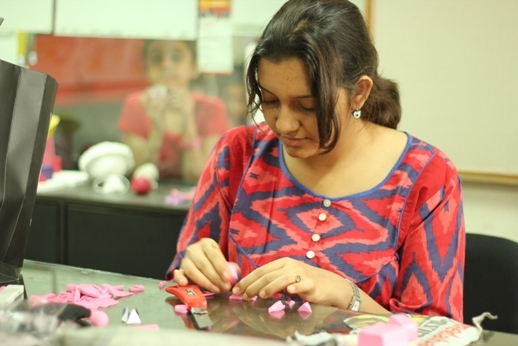 NIFT Situation Test is held at the various NIFT Centers all across the country. In situation test student is required to create a three dimensional model with various materials provided; based on a specific topic or theme mentioned. 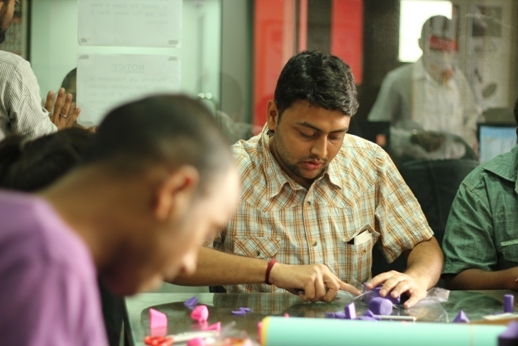 the students is provided with materials like, ice cream sticks, mount board, color papers, straws, thread etc…They are given three hours to make a three dimensional model. The model will be evaluated on space visualization, innovative and creative use of given material, composition of elements, color scheme, construction skill, finesse of the model and overall presentation etc. These parameters will be checked with the write up explaining the concept behind the model constructed. We recommend students to come at Ahmedabad for NIFT Situation Test Workshop, however if due to any reason, a student is not able to come to Ahmedabad, Our team of experts & faculties would be conducting similar workshops in various cities like New Delhi, Mumbai, Baroda, Bangalore, Chennai, Hyderabad & Calcutta. National Institute of Fashion Technology (NIFT) is a fashion institute in India. It was set up in 1986 under the aegis of the Ministry of Textiles, Government of India With its head office in New Delhi, NIFT has total 16 centers across India located at Mumbai, Kolkata, Kangra, Gandhinagar, Hyderabad, Chennai, Bangalore, Raebareli, Patna, Shillong, Bhopal, Kannur, Bhubaneswar, Srinagar and Jodhpur.NIFT offers four-year bachelors, as well as two-year master programmes in the areas of Design, Management, and Technology with total 2800 seats in all the programmes. BRDS has consistently brought out successful students for getting into NIFT and it is proud to achieve highest selection in NIFT compared to any other coaching institute in India. BRDS is the only institute to publish full result year after year with brief about the students, their city, and photos. No institute in India provides results with so much detail.